It should be quite the show: Charter-school advocates are claiming they will bring 12,000 charter-loving students and parents to Foley Square on Thursday morning. The always-entertaining state senator Rubén Díaz Sr. is scheduled to make an appearance. Nearly as compelling as all that street theater is the political maneuvering behind it. The city’s 197 charter schools are hardly monolithic, and many have been happy to work quietly with the new mayor. The noisiest and best-funded charters, however, view de Blasio and the teachers union as a threat to innovative educational methods. 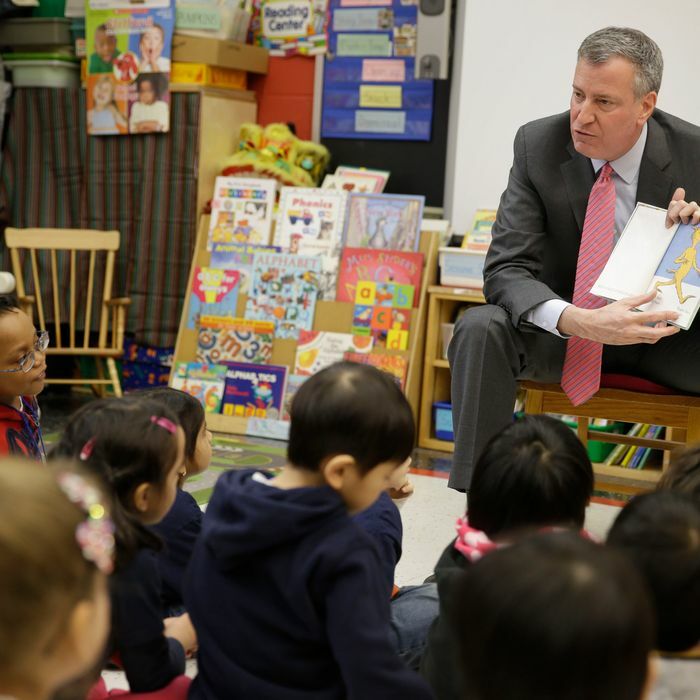 Was de Blasio’s Big Pre-K Win Scripted All Along? So they’ve been shifting tactics to try to put the mayor on the defensive. In August, charter operatives predicted to reporters that de Blasio’s pre-kindergarten rollout would be a disaster. Now, instead of simply promoting the high test scores produced by some charters, the emphasis has changed to highlighting the faults of conventional public schools and to attacking de Blasio for moving too slowly to fix grades other than pre-kindergarten. In the short term, this is partly about real estate (as Kate Taylor smartly points out in today’s New York Times, de Blasio’s moratorium on school closings may make it tougher for new charters to find space). In the medium term, the charters are trying to create leverage they can use in Albany next spring, when mayoral control of the schools comes up for renewal by the state legislature. Perhaps the most interesting dynamic, though, will unfold over the next three years. Some of de Blasio’s allies see the beginnings of a “permanent opposition” to the mayor, fueled by Wall Street money and employing strategists who once worked for Mayor Michael Bloomberg. Several of those operatives have advised charter groups including FES, StudentsFirst NY, and Eva Moskowitz’s Success Academy. Maybe de Blasio’s changes don’t just lower the temperature in the school reform debate but boost graduation rates, and the charter-related business alliances don’t ever expand into a broader political threat. Or maybe the jousting over education eventually opens the door for a 2017 challenge from Moskowitz or Scott Stringer, the comptroller who has lately been more vocal about keeping tabs on the mayor’s programs. For now, at least, City Hall and the leaders of Thursday’s rally agree on one thing: This is all really about the kids.